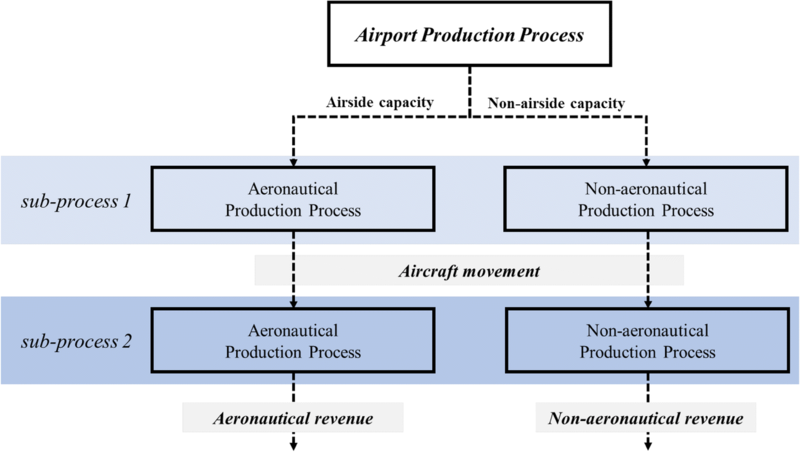 This study evaluates the overall efficiency of aeronautical and non-aeronautical production process. Moreover, it investigates the each stage efficiency using network data envelopment analysis and compares the results with tradition DEA to find out the causes of inefficiency and analyze its stage in detail. The framework for assessing the airports’ performance was devised to capture the trend of airport industry and provide the multiple perspectives to decision makers. It results in the fruition that the aeronautical efficiency does not always guarantee the non-aeronautical efficiency. High air traffic was highly related to the aeronautical efficiency but non-aeronautical side of business could be the driving factors for the whole efficiency. Moreover, looking at sub-processes efficiency, the source of inefficiency could be found. Considering the combined and sub-process efficiency, it can be inferred that inefficiency in certain sub-process could be detrimental for the whole process or could be offset by other efficiency. A correction to this article is available online at https://doi.org/10.1186/s40008-019-0145-3. According to 2013 Airport International Council (AIC) Airport Economics report, non-aeronautical revenue accounted for around half of the total operating revenue. It was estimated that non-aeronautical side of business had been crucial part of the business and would be incredibly important, especially in the volatility of airport business cycle. From each year’s report, non-aeronautical part of business seems to take a crucial role in airport business. There have been a numerous attempts at analyzing the airports’ efficiency adopting a number of methodologies. The researches, however, seem to be outdated since its main focus is on measuring aeronautical side of airports. The idea that analyzing efficiency should be parallel to nowadays airport business trend is the motivation for the paper. Airport is very intricate business in terms of production process. At the same time, it can be easily measured, as most of inputs are quasi-fixed. Once airport is built, it cannot be easily modified due to the high cost of building infrastructures. As a result, when travelers use airports or when airplane takes off or lands at the airport, all the data are collected quantitatively which makes a number of researchers easy to calculate its efficiency. 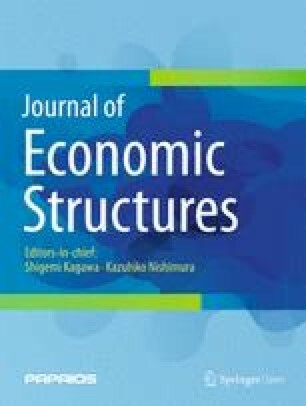 This paper examines and devises the production model for airport efficiency, considering multiple variables. Our focus is to divide production process into several sub-processes and investigate its performance microscopically and analyze the overall performance, comparing with results derived from past papers methodology. Due to the volatility of the airlines business cycle, there has been an increase in urge to maximize profits with non-aeronautical side of airport such as parking lots, duty-free stores, restaurants and so forth. Not only is it important to meet the aeronautical needs, but also it has become critical to capture the needs of non-aeronautical sides, considering that airports’ revenue is being generated from non-aeronautical business. A number of papers have neglected the importance of non-aeronautical sides. In this paper, a new airport efficiency model is presented to evaluate the performance of airports in South Korea, taking multiple inputs, intermediate inputs and outputs into account. We present two NDEA (network data envelopment analysis) models and split the processes into two sub-processes. Then, we measure the relative efficiency of homogenous airports in South Korea and look into each stage. We are capturing the trend of airport performance, and this will be reflected upon our model. In stage 2, we discuss the possible environmental factors and investigate the possible determinants for airport performance. In stage 3, as the airport has quasi-fixed inputs, it is hard just to increase the size of terminal capacity or etc. So, given the circumstances, we investigate what airport could do without compromising consumers’ service quality. In Sect. 2, relevant studies on airport performance are revised. Section 3 presents the framework for airport production model that could capture the trend of current airport production process. The following section presents the data and methodology that have been utilized. Section 5 describes the empirical results derived from data and methodology that we have used. Lastly, the conclusion will be presented. There have been numerous attempts to capture the airport performance efficiency in various methods. Total factor productivity index (TFP), data envelopment analysis (DEA) and stochastic frontier analysis (SFA) were mainly used to measure the efficiency. Among nonparametric methods, DEA has been the most popular method. In the former studies, these methods were adapted by numerous papers: Abbott and Wu (2002), Hooper and Hensher (1997), Oum et al. (2003), Parker (1999), Pels et al. (2001) and Yoshida and Fujimoto (2004). Following these papers, airport efficiency was measured through these methods: Abrate and Erbetta (2010), Adler et al. (2013), Barros and Sampaio (2004), Barros (2008a, b), Gitto and Mancuso (2012a, b), Malighetti et al. (2007), Merkert et al. (2012), Merkert and Mangia (2013) and Nicola et al. (2013). Moreover, there has been a number of researches on Asia-pacific region, measuring different aiport efficiencies in a different timeline (Fung et al. 2008a; Lam et al. 2009; Ha et al. 2010; Chow and Fung 2012; Fan et al. 2014; Li 2014). Oum et al. (2006) and Adler and Liebert (2014) adjusted all financial data according to the tool of Purchasing Power Parity (PPP) when collecting a sample from different Asia regions. Furthermore, after conducting DEA analysis, in recent studies, the usage of regression analysis has become a general method to determine the factors that affect the levels of efficiency in an airport company (Adler et al. 2013; Barros and Sampaio 2004; Chi-Lok and Zhang 2009; Coto-Millan et al. 2014; Ha et al. 2013; Merkert and Mangia 2014; Tsui et al. 2014). Especially, there has been a numerous attempts to explore the additional determinants of DEA estimates using censored regression from Tobin (1958). However, McDonald (2009) proposed using Panel Data regression model to find the influential factors of efficiency for the airport companies. Especially, Chang et al. (2013) found that the more airlines and destinations, the higher aeronautical efficiency, that is, the bigger the airport, the higher chance that the airports are aeronautically efficient. The above studies mainly focus on aeronautical efficiency, which place the number of passengers, cargos and aircraft movement as output variables and runway, terminal, operation cost as input variables. The input of runway was represented by number of runways or runway length or runway area; similarly, the inputs of terminal were expressed by cargo terminal size, passenger terminal size or total size (Chang et al. 2013; Chow and Fung 2012; Fung et al. 2008a, 2008b; Ha et al. 2013; Lam et al. 2009; Merkert and Assaf 2015; Tsui et al. 2014, etc). In addition, the operation cost usually was represented as soft cost input, as used by Oum et al. (2003), Oum and Yu (2004), Oum et al. (2007). Only Oum et al. (2003), Oum and Yu (2004), Oum et al. (2007) and Yu (2004) considered commercial services revenue and airport revenue to output variables. Above all, most studies considered an airport company as a whole by exploring the overall efficiency and productivity change with initial inputs and final outputs. This method treats an airport industry as a black box, neglecting intermediate products of linking activities in an airport company or failing to distinguish the sources from different sub-processes resulting in airport company efficiency (Tone and Tsutsui 2009; Tsui et al. 2014). This issue could not provide corresponding improvement strategies to managers. In recent studies, Puls and Lentz (2018) indicated that airports in Europe improve their non-aeronautical revenue from travelers. And many articles focused on the non-aeronautical revenue for airport sustainability (Chuchu et al. 2018; Kidokoro and Zhang 2018; Fuerst and Gross 2018). Except for the recent attempts to grapple with the black box issues in regard to DEA (Yu 2010; Lozano et al. 2013; Maghbouli et al. 2014), the recent studies were underpinned by exploring efficiency and productivity changes in accordance with initial inputs and final outputs. Airport operation was divided into two sub-processes, including aircraft movement process and aircraft loading movement process. Then, they, respectively, measured the efficiencies of each sub-process. They, however, used input and output variables, which were lopsided to aeronautical efficiency. Liu (2016) tried to capture commercial efficiency using NDEA and regression analysis. For the input in the first sub-process, runway area, staff costs and other operating costs were employed as other paper did (Adler et al. 2013; Coto-Millan et al. 2014; Fung et al. 2008a; Gillen and Lall 1997). In addition, as an intermediate product, aircraft movement was employed to link the two sub-processes. (Yu 2010; Abrate and Erbetta 2010; Lozano et al. 2013; Maghbouli et al. 2014; Pels et al. 2003) As the output, passengers and cargo and operating revenue were utilized. As the output of aeronautical business and other business includes the number of passengers and amount of cargo and the operating revenue reflects the results of business, these factors were included as the outputs. This is comparable to most studies (Ahn and Min 2014; Ha et al. 2013; Tsui et al. 2014; Yu et al. 2008). Then, influencing factors for the sub-process were measured using regression analysis. Airport is a complex and dynamic place where not only does planes take off and land at, but also travelers enjoy shopping, relax while waiting for transfer or have a nice farewell meal with their family or beloved ones. Airport production could be divided into two parts: non-aeronautical and aeronautical process. Aeronautical production includes any activities directly related to aircraft taking off and landing. Airport invests on quasi-fixed infrastructure such as runway and terminal capacity. Moreover, labor forces are required to manage the aircraft movement. These are the inputs for measuring aeronautical efficiency. Utilizing these inputs directly leads to aircraft movement. If inputs were efficiently utilized, the first process would turn out to be efficient. Aircraft movement results in aeronautical revenue that is generated from aircraft landing and taking off. In addition, cargos and passengers are the result of the intermediate input. Table 1 shows that how we are going to apply NDEA model to measure different efficiencies. Variables for input, intermediate and output are chosen carefully with the help of previous researches (Lozano et al. 2013; Maghbouli et al. 2014; Wanke 2013; Yu 2010) and by considering the availability of data. Non-aeronautical production per se is very complex due to the fact that airport is no longer just a place where people go travel by airplane. The non-aeronautical business, that is also known as commercial service usually consists of franchise-based operations and self-operations, such as ground handling agent service supplied for airliners, in-flight catering services, duty free and other retail shops in the terminals, leasing of advertising space inside and outside the terminals of the airport, provision of goods warehousing, cargo handling agent companies (Liu 2016; Adler and Liebert 2014; Oum et al. 2003, 2007; Oum and Yu 2004). The airport is rightly a place for airplane but the business expanded to non-aeronautical side due to the increase in air traffic globally. Studying financial statements for the airport and counseling with airport managers, among inputs for non-aeronautical business, top three contributing inputs were chosen: restaurant size, duty-free store size and parking lot capacity. Inefficiency occurs when aircraft movement is low given the non-aeronautical inputs. Aircraft movement is chosen as intermediate product as airports’ main focus is aircraft taking off and landing. From managerial perspective, decreasing the size of non-aeronautical inputs should be considered if aircraft movement is low; that is, not many people visit airport but excessive investment on building large airport should be reconsidered. For the second sub-process for the non-aeronautical production, if the small number of aircraft movement leads to higher non-aeronautical and the large number of passengers, it could be efficient. This could give us an insight that passengers visiting the airport might spend relatively more money than other airports or a number of visitors visit the airport or the schedule for the aircraft movement is tight. Overall, we want to see whether the inefficiency or efficiency for the sub-processes might have an impact upon the overall efficiency by calculating the overall efficiency. The major disadvantage of DEA is that these processes are treated as ‘black box.’ NDEA, however, separates the whole box into smaller boxes which could give insights to decision makers by investigating the inefficiency or efficiency for the sub-process. This also provides which sub-process could generate inefficiency. The data include 14 airports in South Korea from 2011 to 2015. All data are obtained from Korea Airports Corporation (KAC) and Incheon International Airport. Additional information that is not open to public is requested to Korea government, and the government assisted to gather relevant information by contacting KAC and Incheon International Airport. There has been a number of researches on Network Data Envelopment Analysis (NDEA) and different methods of NDEA are studied (Kao 2014). Liang et al. (2008) presented centralized and noncooperative NDEA using game theory concepts. Non-cooperative model is under leader-follower assumption where first stage (leader) is more important than second stage (follower). This does not fit into airport production process, where both two-stages are equally important and should be considered simultaneously. Thus, we viewed this problem with the centralized perspective, where the efficiencies of both stages are evaluated simultaneously. So, the centralized NDEA was employed to measure the two-stages of devised production processes in Fig. 1. According to CCR DEA model (Charnes et al. 1978), the following can be derived. Equation (4) yields the overall efficiency of the two-stage process based upon assumption that (4) gives a unique solution. Table 2 shows the efficiency ranking of airports in South Korea using NDEA and DEA. And the (#) means the number of same ranks in the DMU group. Top ranking three airports are ICN, GMP and CJU. The results could be easily expected as the number of air traffic for these airports is high due to it is located at the hub of South Korea. The high aeronautical efficiency is inevitable since it is highly related to the traffic. Table 3 shows airport ranking based upon non-aeronautical efficiency scores. Non-aeronautical efficiency gives an interesting result. Tracing the top three airports that show the high efficiency in aeronautical efficiency, rank 2 ICN in aeronautical efficiency is placed at rank 10. Looking at the sub-processes efficiency, it can be inferred that the first stage causes the whole inefficiency; that is, given the significant input of non-aeronautical, it does not generate sufficient aircraft movement. This indicates that ICN invests relatively a lot compared to the aircraft movement. However, the second stage of ICN is ranked 1, which means that ICN generates enough non-aeronautical revenue and passengers. However, the overall efficiency is still ranked 10, which is derived from inefficiency occurred in the first stage. The combined efficiency, which includes aero and non-aero efficiency, should be analyzed if this inefficiency might have a significant impact upon combined efficiency. If this inefficiency can be overcome with excellent performance of aero side of business, ICN will be placed top 3. As the Table 4 shows, ICN is placed at rank 3. This is a bit disappointment as it is ranked 2 in aeronautical efficiency and ICN is a representative for South Korea airports. As discussed in non-aero parts, ICN rank does reflect upon the fact that the inefficiency caused in the first process of the non-aero sides can be overcome but not just enough to beat GMP. Still, it performs relatively well but through our research, inefficiency arises in the first stage of non-aero side of business. TAE, however, is still placed at rank 12, which gives us similar results to non-aeronautical efficiency. This indicates that it is non-aeronautical side of business that TAE’s strategic plan should focus on. Running 3 NDEA models on data provided us a number of different perspectives toward airport industry. As illustrated, separating production processes into aeronautical and non-aeronautical efficiency enabled us to look at the performance in various ways. In contrast, traditional DEA model notably shows the issues of ‘black box,’ which neglects the importance of sub-process. Lastly, combining the non-aero and aero provided the driving factors in terms of overall efficiency. The main objective of this research is to provide multiple perspectives toward airport performance by proposing the framework to measure the efficiency. The devised framework for assessing the airport performance and centralized NDEA established by Liang et al. (2008) were utilized to evaluate the efficiency of all South Korea airports between 2011 and 2015. In this study, NDEA was utilized in order to capture the efficiency for the sub-process as well as the whole production process for aero, non-aeronautical and combined efficiency. Our findings show that the standard DEA model does overvalue the performance, as it does not take sub-processes into account. Employing the centralized NDEA enabled us to view the efficiency for each sub-process for aero, non-aero and combined production process. Using the results, it is concluded that aeronautical efficiency does not always guarantee the overall efficiency. Moreover, it indicates that non-aeronautical sides of business are becoming critical due to the volatility of airport markets. Using the framework that we devised, there might be a number of applications. The globalism is being shackled by terrorisms worldwide. This trend affects the airport industries for sure. The aero, non-aero and combined efficiency could be measured to show the effect of certain terrorism or incidents by showing timeline changes in efficiency. Furthermore, influencing factors for the sub-processes and sources of inefficiency could be found using regression-based analysis as common in the efficiency literature. Therefore, policy makers can use framework in this study for sustainability airport in their nations. MJL designed model and wrote the manuscript. CK supervised the project and revised the manuscript. All authors contributed to approve this work. Both authors read and approved the final manuscript. All data are obtained from Korea Airports Corporation (KAC) and Incheon International Airport. Additional information that is not open to public is requested to Korea government, and the government assisted to gather relevant information by contacting KAC and Incheon International Airport.